...Nina Teicholz, an author who has publicly criticized the science behind the government's low-fat dietary advice, was recently bumped from a nutrition science panel after being confirmed by the National Food Policy Conference. ......Margo Wootan, director of nutrition policy at the Center for Science in the Public Interest, will speak on the panel, along with Barbara Millen, the former chairwoman of the 2015 Dietary Guidelines Advisory Committee, and Angie Tagtow, executive director of the USDA’s Center for Nutrition Policy and Promotion. I just had a rather long conversation with Thomas [Gremillion] and expressed my great concern that he invited Nina Teicholz to the panel without informing us. I apologize for this email. I would have called but I’m sure it is well past your office hours. I will convey the main points of my conversation with Thomas and ask that you email him or call him directly. Basically, I said that this development and specifically the inclusion of Ms. Teicholz changed the panel quite negatively and could result in quite antagonistic situation. I suggested he reconsider including her and indicated that I would hate to withdraw but would do so if necessary. I also expressed that to Thomas that he and other in his organization should have been aware of Ms. Teicholz’ public views on the DGAC report and the DGAs and that I found it very surprising that they included her at all but certainly without discussing the possibility with the other panelists in advance of making the invitation. I hope you agree. I imagine you do. Thomas would like to hear from you directly and hopes you can call or email him in the morning. He called me back within minutes of getting my email this evening. If you wish to try to reach me, I am traveling but can be reached at 781-413-XXXX (my cell). I have intermittent service but I will call you back if I don’t answer. About a half-hour later, Tagtow apparently tried to carry Millen's message to Gremillion by phone rather than in writing. In light of the feedback I have received from all of the panelists expressing concern about the change in the tenor of the discussion that would result from adding Ms. Teicholz, we are going to go with a different fourth panelist (or possibly only the three panelists). I will let you know when/if we confirm someone. I guess you know by now that a fan of mine started a petition to reinstate me to the food policy panel from which I was disinvited, and there are now nearly 3,000 signers. Although you and I may have differing views about how nutrition science has been translated into policy, I'm sure we agree that good science (and thus, good policy) requires open debate. Given the continued rising tide of obesity and diabetes, shouldn't there a frank discussion about different ideas about possible causes and solutions? And if you believe I've made mistakes in my analysis, then isn't this something to raise in a panel discussion? Thomas Gremillion told me that you, along with the two other panel members, refused to participate if I were included. If that is not true, please let me know. The question is now how to repair a situation where it appears the government is shutting down discussion. I don't know if you would support inviting me back on the panel, but it seems that this would be the right thing to do. I look forward to hearing back from you. Thank you for your email and for reaching out. As I hope you’ve experienced with us to date, CNPP is open to hearing all points of view and believes it’s an important part of our process, especially as it relates to nutrition science. I want to be clear, no one here at CNPP, or within USDA, contacted Thomas to decline participation in the panel after he sent an update saying CFA had identified a fourth speaker – you, at the time. Please feel free to confirm that with Thomas, cc’d here. That said, let me take this opportunity to correct misinformation you may have received. First, it was my understanding from Thomas’ initial invitation and updates along the way was that – in keeping with the discussion being about going from science to policy to implementation – my role was to address how USDA implements the Dietary Guidelines for Americans. Second, it was my understanding that the fourth speaker was to be a member of the food industry with a perspective on product reformulations related to the Dietary Guidelines (see below for reference). To that point, I had not received any indication from Thomas that the focus of the session, or my role, had changed to include a debate about nutrition science. Nina, I am simply an invited panelist. I would not make it my or CNPP’s place to supersede the decisions of CFA on session objectives or who the organization chooses for its panel speakers. I hope this helps clarify any misunderstanding you may have on this panel session. Again, thank you for reaching out. Angie thank you for including me in this discussion. Everything you have said below is accurate. Nina, I apologize again for my error in extending you an invitation to appear on this panel. As you can see on our website, we now have a full roster of speakers for this panel and we do not intend to change the panel makeup. Thanks for your emails. I'm truly sorry to cause you any distress, but there is a strong sense, now shared by some 3500 people, including many scientists and MDs, who signed a petition on my behalf, that I should not have been disinvited from the panel. What prevents from adding another chair to the discussion? Angie, I'm glad to hear that you had no objection to my participating. My inclusion would serve the purpose of addressing one of the intended topics of the panel, which was (from the text you sent below), "claims that food policy is not keeping up with the latest nutrition science." This point of view unfortunately does not appear to be represented on the now-revised panel. My inclusion would also arguably fill the consumer advocacy position, since CSPI is so close to the government on these particular issues. The appearance of silencing debate on important issues cannot be in anyone's favor. A better solution would be to appear open to different points of view in the spirit of improving policy so that people might suffer less from nutrition-related diseases. And if "alternative" views on nutrition are wrong and misguided, what better opportunity than a discussion to quell any doubts? I am hopeful, still, that you might reconsider. I would like to visit with you tomorrow about USDA's concerns about this change of course for this panel presentation. Among other questions, on behalf of the USDA, did Tagtow help get Teicholz kicked off the panel? Presumably the best person to answer that question would be USDA Inspector General Phyllis K. Fong. Another question. 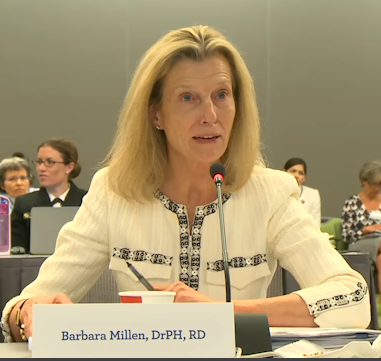 Does Barbara Millen have any 'splainin' to do for her conduct? If any readers get involved, I'd welcome being looped in. Click here for my contact info. This has been slightly revised. Near the top of the item I added that I obtained the e-mails via a FOIA request to USDA.